Nutritious sunflower meats infused with fiery hot habanero chilies, Hot Meats are a great no waste, no mess feed. Why do birds love the spicy flavor? Well, the chili pepper plant evolved over time to be attractive to birds that make it a meal. When a bird eats a chili, the seeds remain in tact and pass through the bird’s droppings where they are spread over a wide area to grow and multiply. So chili peppers may taste hot to mammals like people, but birds do not feel the heat at all – all they taste is “Mmm Mmm Good!” Bluebirds and cardinals are especially fond of the hot Cajun flavor. 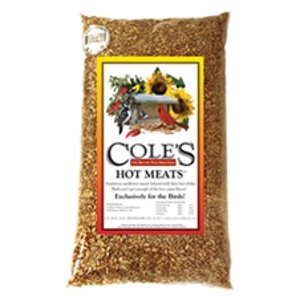 With Cole’s Hot Meats™ you’ll get more bird visits than ever before!